The current month actual figure is shown in red, and the grey bar behind it is the projection, assuming that you continue riding at the rate you have been so far for the month, so this figure will get more accurate the closer we get to the end of the month. You can see this in action on my BikeJournal Tab or by adding BikeJournal to your profile tabs. Hope everyone enjoys the new feature – let me know your thoughts and any suggestions! If you’re not using this app yet, check it out at http://apps.facebook.com/bikejournal; you’ll need to be a member of BikeJournal.com too, of course. 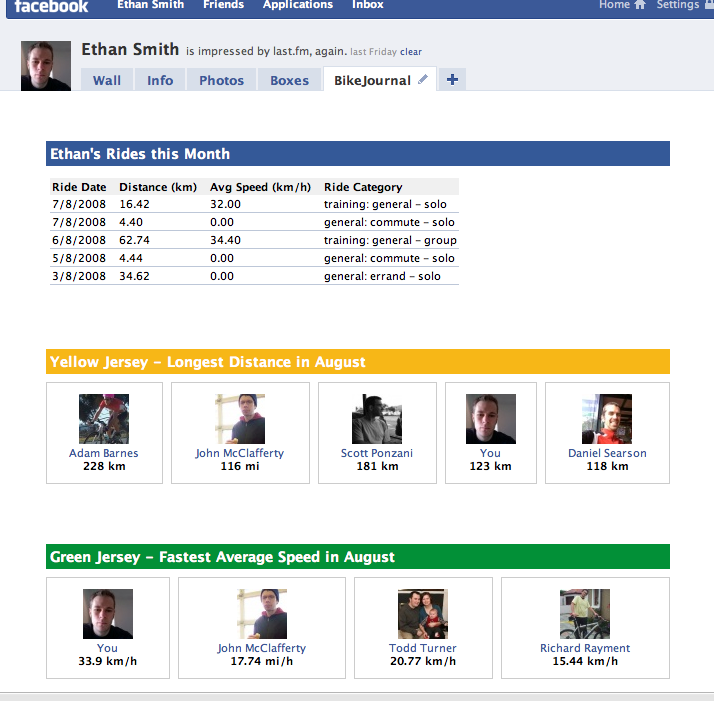 I’ve made some updates to the BikeJournal Facebook App – some performance improvements and have added a new Tab View. This Tab View also shows the two leaderboards – Yellow Jersey with the top 5 users for the month by distance, and Green Jersey for the top 5 riders with by average speed. If you don’t record distance or speed for your rides, you won’t be included in these leaderboards. To add the Tab view to your profile, log in to your profile and click the + button and select BikeJournal. It’s that easy. Get in touch if you have any questions or feedback about this! 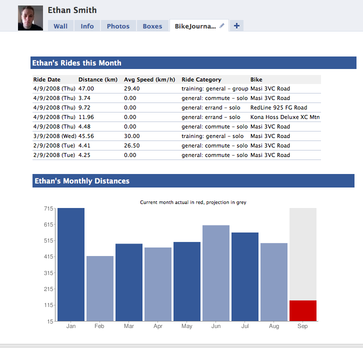 My BikeJournal/Facebook app is ready for general use. I must say that the Facebook platform is pretty nice. A few gotchas, but nothing that really held me up for too long. As should be the case, the majority of my time was spent on my side of the app development (not Facebook integration). In fact, the biggest issue I ran into was parsing the HTML of the BikeJournal journal page.